When Chris Draper tells you his team’s working very hard, you’d better believe it. After waiting a week for the opportunity to chat to the amiable Brit and only then squeezed in between late-in-the-day meetings, Draper’s excuse was hard to challenge, “I’m really sorry but I am just so busy ..."
But, the long hours of training often done after racing is paying off. The team’s seen some 20% increase in boat speed over the past 10 days and enjoyed a vastly improved race against ETNZ on Sunday with a final delta of just over 3 minutes. Sounds like a big gap, and it is a big gap, but as any of the four AC72 skippers will attest to, these boats are not easy to learn. 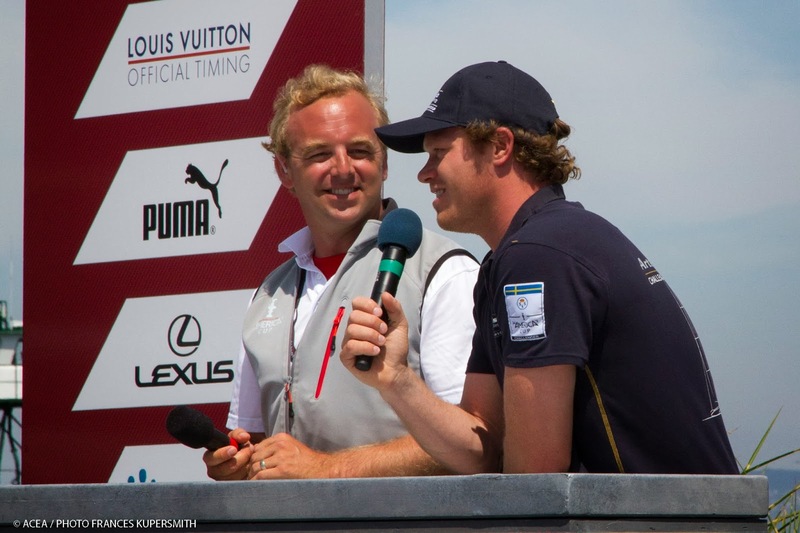 Here, the helmsman of Luna Rossa shares his experiences and expectations. While you had an almost even start on Sunday, you haven’t been as aggressive in the pre-start as may be expected. CD: Yeah, their (ETNZ) maneuvering and boathandling, their boat speed and acceleration is so much better than ours. I’ll be the first to put my hand up and say I haven’t done a great job there, but it’s not easy when the other boat accelerates a lot quicker than you and its top speed is a lot higher. It’s something we’re working on, and we probably should be a bit more aggressive than passive. From the on-looker's point of view it may look like the pre-starts need work, but the reality is we’re finishing 3-5 minutes behind them so whatever we do on the start line it, it doesn’t mean much. What are your problem areas and what are you doing to improve? CD: Our major losses are turning corners and upwind. Those are the areas we are working on every time we’re on the water. Looking at the performance numbers, our performance was a lot better in the race on Sunday and downwind was a lot closer to them. Our jibing is much better, but we are lacking quite a lot on the reaches. We definitely want to be faster, but our boatspeed is getting better. I believe you’ve been concentrating on crew work rather than boat mods over the past few weeks? CD: Yes, it’s just the way we’ve gone with our campaign. We didn’t spend a huge amount of time working on maneuvers, and the Kiwis have worked very hard on that. I think if we were to have given them a race two months ago with the handling we have today, it’d probably be a pretty good race. They’re just a few months ahead on boathandling and maneuvers, and it makes a big difference. ETNZ’s out now and they’ve been extremely helpful on your learning curve. What will you miss about lining up against them? CD: For sure it’s been painful for us because from the outside we’ve been getting absolutely crushed by ETNZ, but I’m fairly confident that any of the other two teams that have been getting out have benefitted as well. It’s been great and certainly made us stronger. You can look at performance numbers until you’re blue in the face, but there’s no better reference than getting out on the water and seeing where you are next to someone. You’re better prepared than Artemis going into the Semis so how will you push yourself against them to keep your game strong? CD: There’s not many days before we race them in the Semis. We’re working hard on the boat to make it as good as possible. We have a few little changes coming there. We’re going to work very, very hard on maneuvering over the next days and keep everything going in a straight line. We still learning a huge amount about our foils and refining the technique. We’re pushing as hard as we can. Way, way harder than we have done in the past. What’s morale like in the team after a pretty rough month? CD: It has been rough but everyone’s working very hard to make the best of what we’ve got and to prove what we’ve got. It makes us stronger so that’s what we’re taking from it. 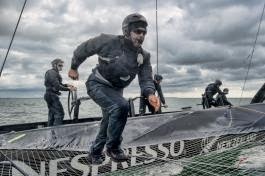 Emirates Team New Zealand had a near catastrophe on Sunday in their sixth race of the Round Robin series in the Louis Vuitton Cup against Luna Rossa, losing their jib on the first upwind leg when a small clip that fastens the jib to the forestay broke. What happened & how did you recover? RD: The clip broke and the jib started coming down. There was no way of rehoisting it because we don’t have a halyard on it - we just have it clipped to the forestay itself at the top of the jib. It’s the first time we’ve had that happen to us. Then, it was a process of deciding what to do. The first idea was just to leave it up because we figured there’d be less drag with it flapping than having it all bunched up on the deck. So we decided let’s just pull it down a little bit but leave it on the forestay, then in that process of pulling it down the zipper came undone and it just blew itself off the forestay. The obvious decision at that point was to just get rid of it off the boat - we couldn’t contain it at that point. We literally cut it free, it wrapped itself around the side stay so once we cleared it from there, we just jettisoned it off the boat and were able to get back into normal racing pretty quickly. These boats perform pretty well without a jib. It was a disaster in one sense but we managed to deal with it pretty well and get it off the boat without any further damage to the boat which was key. The loads on the wing increase quite a lot when you don’t have a jib up there so we had to manage it so that we wouldn’t cause another problem by overloading the wing so we had to back off somewhat. What are the clips made of? RD: It’s a stainless steel clip, it’s a pretty standard sailing item that all yachts use and I think it’s maintained and serviced but this one for some reason has failed and we’re not exactly sure why it failed but there’s a big review going into that at the moment obviously. How often are the clips replaced? RD: They’re brand new with each sail we put up - you get a couple of months out of each race sail but normally a clip would last...well, in a Volvo race you’d normally get a couple of years out of them but you do have to keep the maintenance up on them. Was there any issue with your chase boat picking the abandoned sail off the water in Luna Rossa’s path? RD: The commentators talked it up quite a lot but there was no issue really. Luna Rossa saw that our jib was going to be thrown in the water behind us and we’d gone high and slow while we were doing that so LR was starting to fall into our dirty air anyway and were setting up to tack away before the chase boat moved into the course area. If they weren’t going to hit the chase boat, they would have run over the sail so it didn’t make any difference of the chase boat was there or not. The sail in the water was a bigger issue for LR - I’d say that’s the main reason why they tacked away so that they didn’t get the sail tangled around their dagger boards. What did you lose in terms of time/speed without the jib? RD: It’s hard to put a number on it because you do get a little bit limited without a jib - it probably cost us a minute or so around the course. The Kiwis have nailed the foiling jibe - it looks magical. How long have you had the manoeuver in your arsenal of weapons and how do you improve on it? RD: It’s been on the table since we first started talking about foiling, for a year or so. Even on the team a lot of people thought we wouldn’t be able to foil let alone foil jibe but as it’s all evolved we are able to do these things and that learning curve is still pretty steep. We’re still learning all the time. We started foiling around the bottom mark for example. The better you get at it, the more reliably you’re able to do it with less warning. The next evolution I see doing a few jibes down the run in succession almost which suddenly creates options around the course tactically. What’s the benefit time/distance-wise of a foiling jibe? RD: The big benefit is keeping the speed up and not having a slow bottom speed. It gets you further down the tracks - you literally can gain or lose 100 meters in a good or bad jibe so if you can bank that free 100 meters by doing a good jibe, we’ll take it. Does it blow you away that you’re making foiling jibes on the 72? RD: Oh, it’s very cool, no question. It’s a lot of fun. A few of us on the team have Moths and it’s the same sort of feeling. It looks amazing, it is amazing and it continues to be amazing each time you sail it. Whatever foiling boat you’re on, it’s a whole new sensation and with these boats, it’s a whole other level again. It feels so incredibly efficient and actually pretty easy to do once you get your head around it. It’s just a technique thing and it’s easier sailing the boat foiling than it is not foiling. What have you guys been thinking going into these one boat “races” with your starting strategy? RD: Yeah - we’ve won all our starts so we must be doing something right! Timing and having a good entry is important, where you tack or jibe is very important, and the timing back to the line and where the laylines - even though you’re doing it by yourself the same communication has to happen. You can simulate a start...you’re just not talking about the other boat. It’s a shame that we’re not getting much starting practice in because it’s a very important stage of the race. We’re still learning but not at the same rate we would have if we had a tough competitor there. When we were up against Luna Rossa there was a lot more to talk about and the whole starting sequence changed dramatically from what we were doing by ourselves. We’re desperate for more pre-start practice. How will this affect ETNZ’s performance against Oracle in the starts if you go through to the AC Finals? RD: For sure that’s an advantage that Oracle has - they’re getting some really good some great boat on boat practice and getting used to those close quarters, as well as insight into what each boat was thinking at the time so that they can have some pretty nice debriefs on those sessions. But, there’s only so many moves you can do in two minutes - it’s about being really accurate with where you with laylines and your time on distance. We’re really not too worried. How do you not show off all your “goods” too soon? RD: I think it comes down to the fact that we’re still learning at the same rate and if we have a little edge at the moment, potentially we can keep that edge going the whole way. We can’t slow down and stop developing or learning. We still have a few tricks up our sleeves which we’ll keep up our sleeves until the end. A lot of it is still getting the boat around the track and practicing the maneuvers. If you stop doing the maneuvers you’ll be developing bad habits so it’s all a process really. How are you feeling about the conditions in SF? RD: The racing conditions have been absolutely awesome. We’re going into a phase pretty soon where the racing will start later in the day so we’ll end up statistically in a bit more breeze but it is just a fantastic venue. The reliability is the main appeal - we don’t have too much scheduling around the weather because you know it’s going to be good. It’s a great venue for the Cup. RD: One of the key areas is communication - making sure everyone knows what move is coming up. That’s mainly Dean talking through comms to the guys, the moves, the timing - there’s a sequence of time before each maneuver when everyone has to react to a certain time on a countdown to a tack or a jibe and everyone goes at various times. In a tack for example, Dean’s timing is critical, boards have to be cantered and go up/down - everyone’s role is critical at that moment. Then the guys go down to leeward to get prepared to lift the old dagger board up - timing is the most important thing - you get a window of a second or two at the most when the boat is lightly loaded. If you stuff up and miss your timing, you’re up for a one minute grind on the other side. Honestly, any one of the 11 people on board could stuff up a foiling jibe - I’m thinking it through right now and any one of the 11 could prevent a foiling jibe from happening. Controlling the rakes on the board is a very important job, controlling the timing of dropping the board into the water - if you do it too early the boat will slow down, if you do it too late the boat you’ve missed your opportunity. The boards are critical but it’s not just one person either. In the past a lot of the grinders would be linked into the same function - in a jibe in the past you’d have four guys all going hell for leather on the new sheet. On the 72 you have those four grinders potentially doing different functions during that same maneuver. Everyone has to think for themselves - it’s very choreographed. Can you quantify the effort that’s gone into the precision timing? RD: It’s literally time on the water. From very early on in our sailing program we were working on maneuvers - tacks and jibes and how we could improve them. That was going on equally with performance as to how we were going to manage these boards up anddown and control them, and manipulate the wing. It’s literally been every day we’ve been out since launching boat one we’ve learnt about maneuvers and speed. Making careful notes and video of how you all move around the boat, then analyzing that and discussing how to do it better. It’s also how we can design the boat to do maneuvers better so we work very closely with the designers on what we need to be able to sail these boats efficiently. Andy Green (former match racer and well-known America’s Cup commentator) and Tucker Thompson (owner of www.t2p.tv/‎ video production and broadcasting) have the onerous task of commentating on the first “races” of the Louis Vuitton Cup. It is a task unique in that, with the exception of one “real” race--which didn’t count anyway as the trailing team did not complete the race within the time limit--the remaining “races” have seen Emirates Team New Zealand and Luna Rossa solo it around the course. Bizarre but real, and looking at the AC schedule through the end of July, there’s plenty more one-boat racing to come. So just how do professional commentators take this “racing” seriously, and make it interesting for those wondering, “What the heck?" Here, the ever-gregarious Green (38) tells how it’s done. What’s it like commentating on a one-boat “race”? AG: First off, in both Auckland and Valencia, in the first month of the Louis Vuitton Cup there was similar public concern over the success of the event. In Valencia we had super light wind and a lot of the racing had to be canceled--it was like the next disaster of the America’s Cup; in Auckland not nearly as many people showed up in the early stages as they thought there would be, particularly during the weekdays. From that point of view, I see what San Francisco has done to encourage a reasonably healthy number of people to come visit the site. As far as the one-boat races are concerned, Tucker and I have taken the view that we’re served with a plate, and we have to make the best meal of it that we can. What we’ve tried to do is bring in lots of guests, other experts, we’ve been able to get very comfortable with some of the rules and things that we will see on the racecourse. It’s an opportunity for us to educate the super keen fans who are watching about the racing. There are a remarkable number of people who will take anything from the America’s Cup. They’ll watch anything, including one-boat racing because they want to see the boats foiling, and they want to see the crew work. A lot of people have been very passionate one way or another about this new boat and the America’s Cup, so we’ve had loads of messages on Twitter and Facebook. The last couple of one-boat races we had Dave Carr (Luna Rossa) and Richard Meacham (ETNZ), both of whom have been our best guests, who provided some fascinating insight into what’s happening on the boat. The races are shorter, so when we get closer to “sporting” races with two boats and hoping that the races will be close enough, there won't be any time to talk about the more intricate elements of putting the board up, the wing faring, the aero and hydro design packages. What are you learning in this new AC? AG: The fundamentals of sailing a boat are still the same. However, what is very clear about these boats is the coordination of crew work is critical, so things are happening so fast. They’re “under-staffed,” but there are lots of things that have to happen in a jibe or a tack: the boards up and down, the wing across, everyone traveling across the boat, grinding. It’s an extremely choreographed performance that requires all 11 people. The other thing that’s clear is how much there’s left to do to refine the boats. The boats are traveling downwind sometimes up to 40-plus knots so the farings and aero packages that are on the beams are increasingly important. The aero refinement could mean another knot-plus for your boat. Certainly one of the teams are looking for another knot in aero refinement. That’s quite a lot. Yesterday Luna Rossa came out with different aero boards on their front beam. They were about 2-3 feet longer on the beam, and that’s a good example of aero foil refinement. That was obviously an improvement. The third thing we’ve learned is the very interesting trade off between how early you get the boat up on the foils and how much drag you generate underneath the boat. The crew work, aero and hydro and the foil element, which is rudder and daggerboard--specifically the angle at which the daggerboard comes into the water and how curved or straight it is--has a significant implication on whether you foil early or late, and how much drag you generate under the boat. Now you’re tuned into these details, how much of it can you observe while you’re commentating? AG: We can see some of it, as we did yesterday with our guest helping point out some of the details. Tucker and I are learning as each day goes by. We’re doing tours of the bases. We’ve got another tour booked in with Luna Rossa and Oracle on Friday, so that’s another chance for us to look at some of the developments and get answers to the questions we’re being asked by the public. Do you think we really will see close racing? Do you think Luna Rossa is going to pick up their pace? AG: I hope so. I know they’ve got lots of developments they can make. 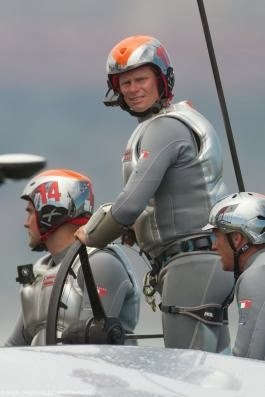 At the end of the day, I’m a big fan of the America’s Cup, and I just want to see good, interesting racing. What are you seeing with the boathandling that you can comment on? AG: Certainly, ETNZ is like a slick operation. I haven’t seen anyone yet show off their moves so publicly both racing and in media. Oracle have got some great media but haven’t shown quite the same extent of what they have. I can entirely believe that’s strategic, holding stuff back. The Kiwis don’t really have that luxury because they’re already in the Louis Vuitton Cup. It’s very hard to go out, even on a one-boat racecourse day and not race at pretty much your hardest. They’re out there practicing jibes and showing off their moves, and they’ve got some funky moves. The big deal this past week is the rate at which, and the stability at which, ETNZ’s been able to get through a foiling jibe. Comments? AG: As I said, ETNZ have shown some pretty slick moves. A couple of foiling jibes on the second race when they were just doing the one-boat race--no less than 30 knots through a foiling jibe, never coming off the foils. There’s a general feeling around the Challenger camp that’s pretty impressive. We had Murray Jones as our guest that day. He wasn’t shouting from the rooftops that Oracle had been able to do that for months already, he was more circumspect. If all the boats with the exception of Artemis are foiling jibing come the LV finals and the AC match, we’ll get some pretty cool racing. Generally, what do you think of the boats? AG: I think they’re amazing; I think they’re mesmerizing. They’re beautiful, which is one of the crucial elements of having an America’s Cup design. America’s Cup has been very lucky to have developed beautiful boats. The TV coverage makes them look even better. We’re still in the early stages, so there’s not as many cameras about as there will be, but all the bells and whistles on board will come. The TV is fantastic with the boats. One big concern for me is that they’ve got rid of the spinnakers. You don’t get quite the same sense of upwind and downwind. You know the boats are going downwind because they’re foiling, but it’s a shame for the non-sailor not to see someone pulling a line and the spinnaker going up and rolling out. I really enjoyed that with the AC45s. My suggestion for the next go around would be to find a boat you can have a gennaker, but it’s hard to do that when the jibes are so fast on these boats downwind. Do you think the starts will become exciting? AG: You can’t win an America’s Cup race unless you know how to match race. With these boats, if you get ahead there are a loads of ways you can keep a boat behind you. You can’t win the America’s Cup if you get stuffed at the start in every match race. It’s hard to. The boats are amazing, and all previous America’s Cups have always delivered. The real America’s Cup fan will spend four years excited, upset, moaning, going through the roller coaster of emotions, and all they really want to see is the first two minutes of the first race of the America’s Cup. You have to be kind of crackers, but that’s the moment that’s so exciting. Any other observations from where you sit? AG: The facility here is amazing. I’m an independent commentator but part of me wants it to stay here. So much effort has been put into it that it’d be nice if it could stay in San Francisco and go round here again, but that’s not the way of the America’s Cup. More than ever, the responsibility of being the principal structural engineer in an America’s Cup campaign is daunting, regardless that the design and build of an AC72 is a team effort. At Emirates Team New Zealand, where Dalton’s boys operate a lean machine devoid of the frills and extra dollars that some of the other campaigns have at their disposal, the Kiwis appear to have designed a solid boat that has successfully transitioned from the Waitemata Harbor to San Francisco Bay. 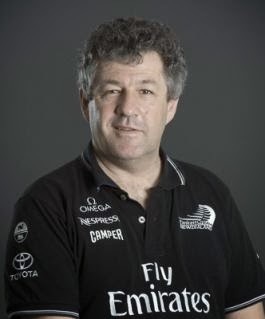 Fifty-two-year-old Giovanni Belgrano, principal structural engineer for the team, has worked in the Cup for 25 years on and off as a partner in a composites consulting company called SP Systems and specifically with ETNZ in 2007, Luna Rossa in 2000, and America3 in 1992. Here Belgrano explains how ETNZ has managed to keep it all together thus far. What’s the specific goal of your job? GB: The design is structurally driven, so I work with the design team to come up with the best solutions in terms of getting the most effective performance that we can and the structural stiffness and strength that we need to go fast. We’re now in the final stages of development which include final refinement but mainly monitoring performance of the structure and making sure we’re ahead of the game--sailing the boat harder now that we’re in the venue, learning the San Francisco conditions. What have you learned about the conditions in San Francisco? GB: We sort of knew them, but there’s nothing like actually being here measuring the loads and recording the structural behavior of the boat. To give you an idea of my day today, it was a sailing day, and I have to prepare the boat and get it in the water. Then I sit on the chase boat with an iPad and look at the strengths and loads in the structure. We have a number of values that we have reached in the past, and every single maneuver and every single angle that we’ve tried in race training. I carefully look on the water at what’s happening, then what I’m doing right now back in the office is typing a memo with a list of things to check after today; that’s because we’ve hit a couple of records in a few areas. Every day we try something different and record all the strains and the values with fiber optics on the boat, so I make sure that I can report which areas have been loaded more highly than usual today. There are only two areas today which is quite good. Can you tell me what those areas are? GB: The mainbeam starboard--we’re keeping an eye on the fibers in one of the main beams, and there’s an area on one of the boards which today has reached a higher level than before, so we’re going to look carefully at that also, in addition to the standard checks that we do. The shore team has a set of checks that they do post-sailing, and they’ll go on the boat and check those areas more carefully. Are you able to “see” any issues that may be occurring on the boat as you’re following on the chase boat? GB: We work on several levels; one is that you can visually look and see that the boat is going fast and the team is developing new maneuvers and racing techniques. The other level is that you can check on the computer from the boat instruments how fast they are going, how much wind, what angle they’re sailing, etc. The final level is ... if we get too close to anything we’re going to get an alarm warning if we reached a certain level. We also reference all the records we have achieved, like the highest levels we have reached with certain loads. We load test the boat before she goes in the water, then we do another load test in the water. So that’s what I’m doing: monitoring loads while we’re sailing. Have you seen changes in the structure over the 33 days that your second boat has been on the water? GB: No, the structure has stayed the same. The only change is the way that we sail it, the maneuvers we do. They’re like kids--you have to keep an eye on them every single second because to prevent a failure, even to anticipatem we need to visually see, then we discuss the maneuvers the guys are doing. Then we have a much better understanding when we look at the data. It’s a high priority, but we only have one thing left to do ... win some races. What is a fiber optic load sensor and how are you using them? GB: It’s a fiber made of glass not much thicker than a hair that transmits light. Little grooves are made in th epoxy, and the fibers are dropped into those grooves--the same as is used in telecommunications. The fiber is embedded in the laminate all over the boat: in the rigging, the daggerboards, etc. If you stretch or compress certain areas, a certain amount of light transmits through the fibers which provide us with data on how much stretch or strain has occurred. We spend all our time monitoring how much everything is stretching, whether it's rigging, or laminate on the boat, or the daggerboards or rudders--how much they are bending. How do you monitor its behavior within the structure? GB: There are things called interrogators which can handle about 40 channels each, and they send light through these cables. At each point where we want to know what’s happening--it’s only sensitive at a given point, every 2 meters or 1 meter or 250 mm, they are manufactured for us to the specs that we want--at that point it stretches and the light will go faster through that part of the fiber. Therefore we know how much force there is on the laminate at that point. There is a computer in each hull, and we see the data via WiFi. Then we download it when we get back to shore. It’s pretty cool actually to see the boat highlighted and everything that is happening. We initially used to go on the boat to try to look at the data, but it's nearly impossible with the spray; then the iPads go haywire and you have no screen! So we watch from the chaseboats instead, see the data, and talk to the guys on the radio. GB: This is new for ETNZ, and it’s our first time using it as a primary active system. It’s typically used for very specialized testing. It’s not that commonly used as it's very delicate and complicated. How were you previously managing the observation and monitoring of structural issues? GB: A more old-fashioned but still more reliable electrical resistance system called strain gauges. They’re embedded into systems called load cells which are everywhere. Fiber optic supplements the load cells and the pressure sensors. There’s a lot of hydraulics on these boats (most of the controls on these boats are hydraulic)--all the hydraulics have pressure sensors so you can measure the pressure and therefore understand the force. What’s the procedure if something looks suspicious while you’re out on the boat? GB: We call them on the boat and discuss what we’re seeing if the loads are unusual. The boat gets synced to a thing called the blueprint: a number of standard settings. They don’t improvise, they sail by the numbers, and they can see the loads on board through all the load cells I’ve described. They do most of their adjustments against those load cells. They are very load conscious on the boat. What’s been the advantage of the fiber optic system? GB: We have more detailed information about what is happening. It’s actually a lot more to worry about! The more information you have, the more concerns you have. How’s your speed out there? GB: I think we’re building up to the regatta. Right now we’re focusing on venue development, understanding the venue--it’s very tricky to sail here--and of course skill practicing. There’s never enough time to practice enough and perfect all the maneuvers, meantime the boat has to hold together. We’re going faster all the time and trying new tricks all the time. Each time is a new experience. Your thoughts on multihulls/AC72s in the America’s Cup? GB: They’re a significant challenge engineering and design-wise. We’re not doing this because we like working on it, it’s what we're told to do if we want to challenge for the America’s Cup. I don’t mind them--they’re interesting, but they’re certainly not practical. Technologically challenging, and generally speaking, totally impractical!